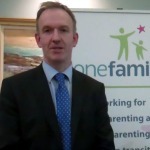 During National Parents Week 2014 we’re asking, “What’s the important issue for you around positive parenting for changing families?” Watch this short video where Donagh McGowan, Solicitor and incoming Chair of the Law Society Family Law Committee and member of the Family Law Court Development Committee, talks about his important issue: how to address the failings of the current family law system. Donagh was a speaker at our Positive Parenting for Changing Families Seminar on Tuesday 21 October in Dublin Castle. Other speakers included: Stella Owens, Centre for Effective Services, Chair of Special Interest Group on Supporting Parents; Helen Deely, Head of HSE Crisis Pregnancy Programme; and Niall Egan, Jobseekers and One Parent Family Policy Section, Department of Social Protection. The panel was chaired by Dr Anne-Marie McGauran, NESC, and One Family Board member.